When the time comes to add or remove columns from your Appointment page, simply follow these steps to change your Simple Inked package. You can upgrade or downgrade your package any time. 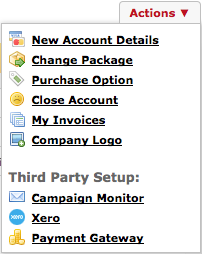 Pop over to your Account page and in the Actions menu select Change Package. On the right side panel choose your new package. 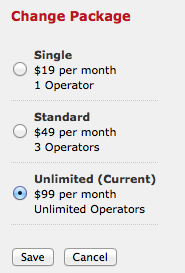 Just incase you were wondering, 'Operator' refers to an operator column in the Appointments page. Therefore if you require one appointment column, then you will go for the 'Single Package'. You'll be greeted with a message like this one, and yes I would like to confirm. 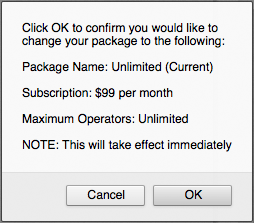 Note: If you are downgrading your package, you will need to first remove / delete all additional operators, so that you don't have more that the package limit. Before you go and do that though, you will need to make sure that you have moved all future appointments from the operators column into one of the operators columns which is not being deleted. You can use the Appointments Report to view future appointments for each operator.